O Christmas Tree, O Christmas Tree...enjoy this beautiful add-on collection of hand-tatted Jumbo Snowflakes (3"-6") with and without hangers (come without shadows for you to personalize). 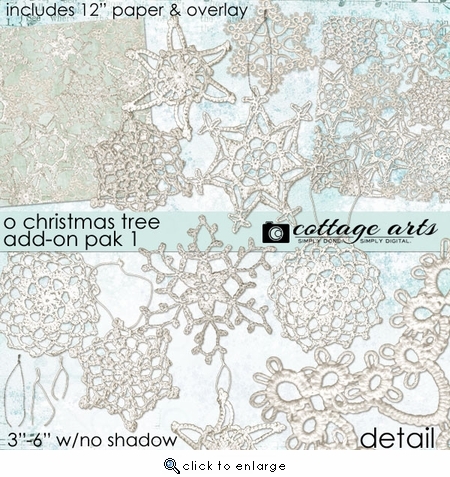 Also includes a very unique snowflake paper and 12" Snowflake overlay. We can't wait to see what you create with them! Includes 6 unique ornaments (most with and without hangers), paper, overlay, 3 hangers and 16 total graphics. Coordinates with our O Christmas Tree Page Pak.